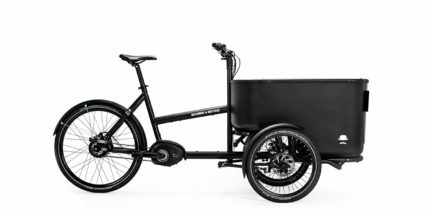 Butchers & Bicycles is a Danish bicycle brand that designs, develops and builds cargo bikes. The company was launched in 2013 by design engineers Morten Wagener, Morten Mogensen and Jakob Munk. Headquartered in the meatpacking district of Copenhagen Denmark, they build bikes on the values of simple design, high quality, and uncompromising usability. Their first product, known as the Mk1, is a three-wheeled cargo trike. The trike, also launched in 2013, is designed to lean into turns to create a fast and intuitive ride. An incorporated Built To Tilt™ system allows increased stability around corners, making it ride like a two-wheeler.